For some of you that when radio aahs was on the air broadcasting on am that it was the most. Like radio station. Good memories from it. 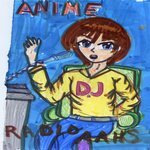 Anime radio aahs.it will be updated each week. Who knows it might bring the forum more active. How about it sakura are you gain?